As adults, we are sometimes reluctant to experiment with new food. So it’s not uncommon for children to feel even more uncomfortable to eat something they have never tasted before. Do not compare your child with other children. With time and gentle encouragement, he or she will eventually be comfortable with a bigger variety of food. You just need to start by understanding the source of the problem so you can customize your approach. Imagine what would happen if you scold your child: “Eat your broccoli or no TV later!” Your child senses the anger in your voice when he or she is already feeling physically uncomfortable with food. Now you’ve added fear to his or her mealtimes. Suppose you say, “Eat your broccoli so you’ll be as tall as dad”, in an encouraging ‘you can do it’ voice. Your child hears encouragement; they feel supported and loved, and is more willing to eat or accept the food you prepare. If you want your child to eat, think about how you’re presenting food on their plate. Your child may refuse to eat if the food does not look appealing no matter how tasty your food is. Separate food groups by colours, shapes, or textures. Children prefer more food choices on their plates. For example, place the cabbage at top left, carrots at top right, chicken at the center, and potatoes at the bottom. Separate the foods from each other to avoid overcrowding. Did you know, children who eat meals together with family are more likely to explore new foods? Don’t expect your child to eat cabbage if you don’t. 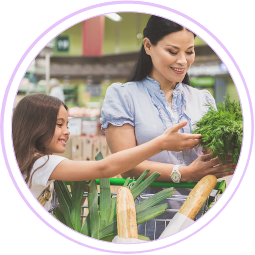 Demonstrate positive eating habits you want your child to adopt. Describe any new taste, texture, or smell so they know what to expect before eating it. Be patient when introducing new foods to your child. Serve small portion sizes before moving on to bigger portions. Make every mealtime positive and enjoyable. Talk to your child about their day at school, or share yours. Avoid negative associations or topics that will affect your child’s mood during mealtimes. Children learn best through their senses. Take your child to the market. Pick an apple and ask your child to smell or touch it. If they get familiar with the food, your child will be more likely to eat it. Let your child help you in the kitchen. Your little chef can mash the potatoes, break the eggs, mix the salads, or set up the table. 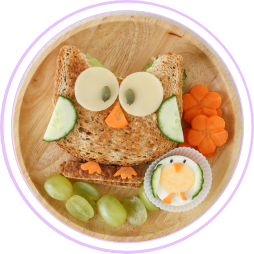 Being involved in meal preparation keeps your child’s curiousity piqued, and he/she would be more keen to be part of the end result: eating the food.